Some very positive new changes have come from lawmakers with regards to new California solar permit fees. At the start of 2012, the days of massive permit fees by local municipalities as well as other local governments are no longer for solar projects. Not only is this great news for the planet, but it is also great news for homeowners, but this is great news for businesses as well who want solar energy. This new law makes life so much easier compared to the varying California solar permit fees and permitting costs that used to exist prior to 2012 in the state of California. Now, everyone who is interested in solar power will be able to estimate the costs and benefits of a new PV system almost down to the penny. Before, it was always a guessing game as to what the additional expenses would turn out to be. If you add in the additional benefits that have started to happen in the solar panel markets around the world with prices continuing to decline, solar is once again becoming more favorable. Especially for enthusiasts who are looking at this form of energy production with a long term goal in mind. The details of the regulations can be found at the DSIRE website under California’s New Solar Permitting Fees. Details of the California Assembly Bill 1801 are also available to read online. The tension is heating up, the mercury is rising, but at the end of the day, we must all ask ourselves what is really going on with China and the rules and regulations in whatever country you live in. And of course, we’re talking about the new fights that are consuming the talk and time within so many government and lobbyist groups throughout the world with regards to solar panel prices. The US Government and Department of Energy are talking about how solar is so much on the rise, why would they want to stop the progress. One one hand, there are the local countries such as the United States which are very concerned with the alleged dumping of solar panels and very low prices of PV panels on local markets by the Chinese. And on the other hand there are the factories and companies outside of China that are struggling to produce low cost solar modules to compete with the ever growing Chinese production market. For any economist who should be very familiar with the free market concepts, and I’m not just talking about people who work in the World Trade Organization (WTO) or other respected (or maybe un-respected) groups, the free market ideals don’t put up with the idea of price dumping. Prices are set, and products are sold. If a manufacturer is willing to place prices so low that they are at risk of losing money, well, that is a business mistake that is in almost all cases going to benefit the consumer, and to the masses, this should be looked at as a great opportunity to purchasing a great product at a low price. It is not a mystery that solar panels produced in countries like the United States are often much more expensive when compared to the exact same solar panels produced abroad. And when I say “exact same”, yes, you can duke it out that there are many differences, but the facts are the facts. Panels when you look out energy output and ALL of the other minute variables are often virtually the same just with a different logo stamped on them. That’s what the marketing guys are paid big bucks for, and yes, marketing costs hurt consumers as well. So you do the math. Would you rather pay higher prices for solar, which in turn means higher prices for clean energy, or would you rather get the cheapest possible prices on foreign solar panels made in China? The choice currently is not yours, but maybe after the government completes the bickering that is currently going on, you may be able to decide afterall. How about a big two thumbs up, and make it your green thumb for some neighbors living in Berkeley, California. 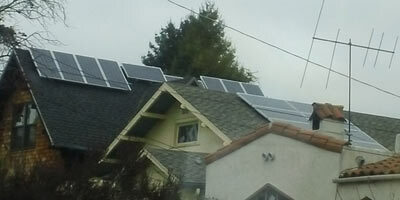 It’s such a great site to see not only one, but two houses next to each other that are both making their own electricity from the most powerful thing known to man, the sun. Although you might be living in a city or town somewhere in America where solar power is relatively new, or maybe even unheard of, that’s just not the case for the residents of Berkeley. Long known as a hippie idea, or tree-hugger initiative, PV solar cells used to generate kilo watt hours is still going strong. And with the help of higher oil prices and higher energy costs slamming the economy over and over again, more and more “non tree hugger” types are looking into alternative energy ideas. Call it green technology, call it doing something good for the earth, call it whatever you want, but this type of energy is here to stay. And it is saving some lucky homeowners who are used to paying very high PG&E bills quite a bit of money. So what if the street view of solar cells makes the houses look ugly, that’s usually not a concern anymore from neighbors. 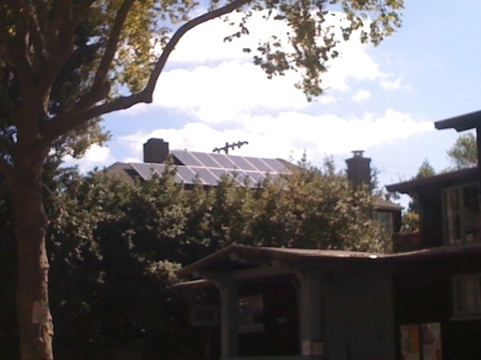 Instead, neighbors are jumping on the band wagon and figuring out how to get solar panels installed themselves. If you really are worried what your neighbors are going to say about you going green and getting panels on your roof, just go and sack up and ask them. You’ll be surprised how happy they are to help you out and say “go for it”. That was the case with these neighbors. 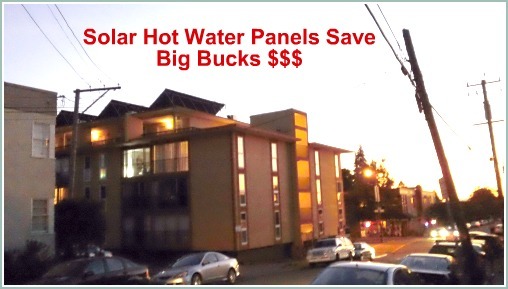 And, by the looks of the number of panels on the roof, it is quite possible that they are saving roughly $200-250 dollars per month off their combined electric bills. That’s great news! The Price of a 2kw Solar Panel System – Is It Worth It? Recently, there are many advertisements running on TV comparing prices and sizes of different PV solar systems, and it is time that we investigate just what is happening in terms of the consumers true value received. 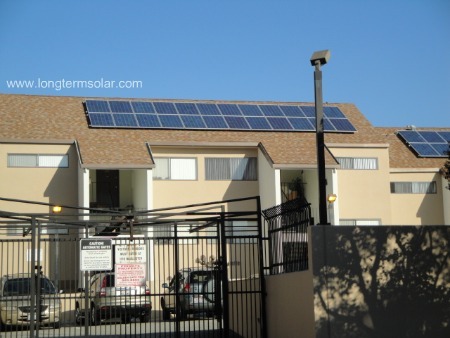 One particular commercial is promoting a solar system that is rated at 2 kilowatts or 2kw. The company, Petersen Dean Solar, talks about their pricing being substantially lower than the competition, by over $3,000 in costs. They advertise their solar system as costing only $6,000 compared to their main competition’s pricing on the same two kilowatt system at $9,000. The competitor they mentioned is Solar City which is a larger and more well known solar installer in the United States. So let’s do some math and find out if a $6,000 solar system that is rated at 2kw is even worth the investment. Before we begin, please take note that solar incentives are different throughout the country. In fine print, Petersen Dean did mention on the TV advertisement that this $6,000 cost was after incentives. It is unclear if Solar City’s pricing numbers were before or after the incentives. The location of the Petersen Dean pricing was for Northern California, so we will use variables for that region of the United States. You can go ahead and use the sunlight hours page to calculate your specific numbers for your local area too. Annual Electricity Savings of $1,014 each year. 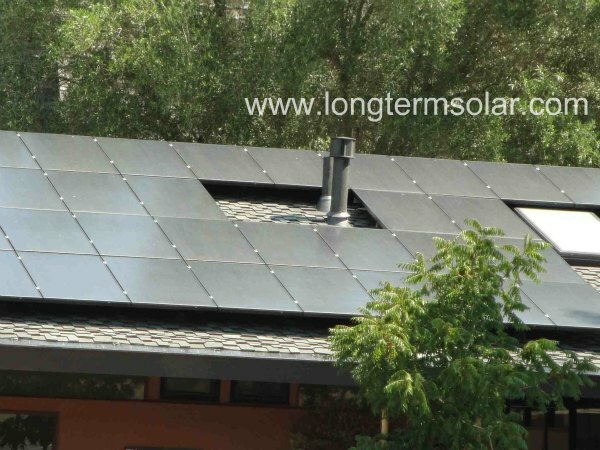 So, it looks like a system sized at 2kw would pay for itself in just about 6 years of service, which is a great investment considering that solar panels are able to last for over 25 years or more. One thing to remember when calculating your solar panel investment is the cost per kwh from your local utility company. In the Bay Area of California, PG&E (Pacific Gas and Electric) is the utility company and their rates for electricity are very expensive compared to other parts of the United States. This greatly affects the investment outlook of solar power. How Much Electricity will Solar Panels actually Make? For many residential houses, the south and south-west angles that these solar panels need to have is not going to be an eye-sore, and even if a neighbor complains, ask them if they are worried about their carbon footprint. By decreasing the demand on electricity from the local electric company, every solar house is doing the neighbors a big favor. During the summer months it should be expected that the solar panels will be making more electricity compared to winter months, that you should have already guessed. Some people do clean their solar panels with water occasionally but that is really not necessary. Let’s face it, everybody no matter who you or your organization are are using electricity. That much we can all agree on. When there is an interest in finding alternative power sources such as PV solar panels, it is really important to figure out what the barriers are to implementing an actual solar system. A church in the San Francisco Bay Area decided it was time to get solar panels installed on it’s roof, and the system look pretty amazing. But, what’s most important is that the system is as efficient as possible because the overall expense to a church for solar energy can be enormous. Here is a picture of what a nearly 18 KW SOLAR SYSTEM looks like when the sunshine is shining on it. How much electricity is this solar system really providing to this church and is it a good financial decision? So, if we look at the picture, we can figure out the rough estimates for the math. From the table above, you can see that this system will be making approximately $6362.00 per year of electricity. That is a fairly large number, but we need to compare that to the system’s overall cost. At 17,600 watts, and lets assume that the system has a cost of approximately $6/watt. That would mean a PV system cost of roughly: $105,600. Of course there are probably some local rebates and maybe even some state level and federal rebates or funding programs, so this certain location with high costs in terms of kilowatt per hour charges might make sense for a longterm solar option. If you were part of a church which was paying only $0.10 per KWH of electricity, the cost structure would be totally different and probably not make very much sense to buy solar power. First, let’s look at what could be expected from a 3 kW solar panel system that is producing electricity from solar radiation. The overall appeal of a solar system in this area may need to come from areas other than financial gain right now. This 3 kW system is going to produce an average of roughly 4000 kwh per year of clean energy, but that is only going to offset a very small amount of someone’s electric bill at just over $300 of electricity. You would really want to investigate the local and state level solar rebate programs in Georgia, along with current federal tax credit information to find out if you would be able to turn the investment into solar power more beneficial to you. As you can see, with the 4kw system, the results are directly proportional to the smaller 3kw system. Posted on 27 August 2011. Here is a look at the expected values a solar panel system would be able to create in terms of electricity and final dollar savings on a monthly basis in St. Louis. A key component to this equation is the actual cost per kwh for each person from the utility company. If that number is higher than the $0.12/kwh used in this equation, it will positively affect the value of a solar system for future years. A great idea for anyone considering going solar in St. Louis, MO would be to investigate the local solar credits or rebate programs that might exist. This will ultimately make the decision making process to go or not to go solar much easier. Many towns are begin to adopt favorable programs with either property tax exemptions or other local rebates to help with the upfront solar costs.